Joan is second to complete her Crabapple Quilt. Do any of you recognize your 9-Patch contribution? Mine is still stored neatly in the baggie it was packed into when it was separated. Collette and Karen still have yet to get theirs. Wonder who will be next to finish? Kaktus is starting to take shape. I am ten rows into the top with five more yet to sew in place. I have a solid tan for the next border and then a border of flying geese. I like what I see so far. It will be nice to have this challenge complete. It seems as though I have been working on it for a very long time. Nothing more to share today. I hope you are moving along on your projects. See what others are doing through the links at Patchwork Times. Have a great week ahead. Its back to working on Kaktus for me this weekend. I spent the first part of the week with hand sewing the binding, sleeve and label on Kommodore. Kaktus has 15 more blocks to assemble before all the components are finished. I'm all set to stitch them today. Perhaps before the day is out the rows will start coming together. Janet...if I'd had five more blocks to put together I'd have run out of darks! Kerry is talking about working on Knickels next. I've got a few in the queue... For this week nothing to report as used or purchased. It is looking like Kaktus might be next week... Come back tomorrow for Design Wall Monday, but until then see what others are doing with their stash at Patchwork Times. I'll be working on Kaktus this week. I'm at the point where sewing the blocks together starts. I can't begin to say how glad I am that I started this UFO before it was called. I have all the monthly challenges for August finished. Time to work on a few other things that aren't yet on a challenge list! This is Kommodore. I got it back over the weekend from Kerry's Quilting. 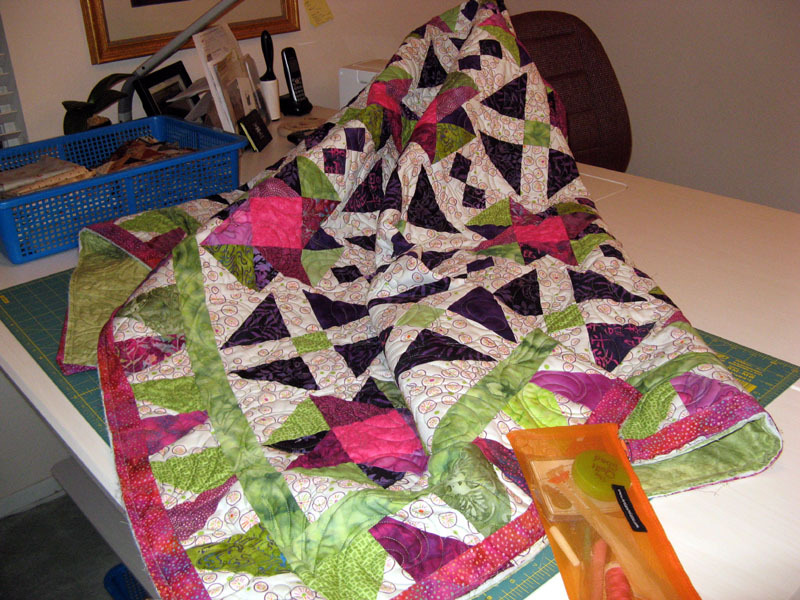 I'll try to get a photograph of the quilting on this beauty when I have the binding down. I know lots don't like the binding part, but its one of my favorite parts. 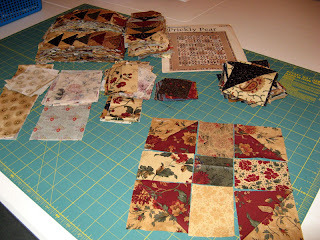 I'm anxious to see where I ended up with Kordova Klosure in this week's theme Scrappy Quilts with the Quilt Gallery. There's a button on my side bar if you want to check things out. This is a fun weekly contest. I wonder if I'll have anything that will fit next week's theme? Today is my first of four scheduled physical therapy appointments. I'm still hurting from my sciatic flare up. I'm sure hoping for some magic! I've been slowing getting better; this has been going on since the middle of July...enough! Have a great week. Its supposed to be a warm week in San Diego again. Like everyone else it will be nice when southern California gets back to what's normal. 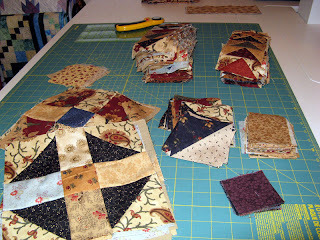 See what other quilters are doing in with their fabrics at Patchwork Times. August 2012 UFO DONE! I'm happy to say Klappers is finished. 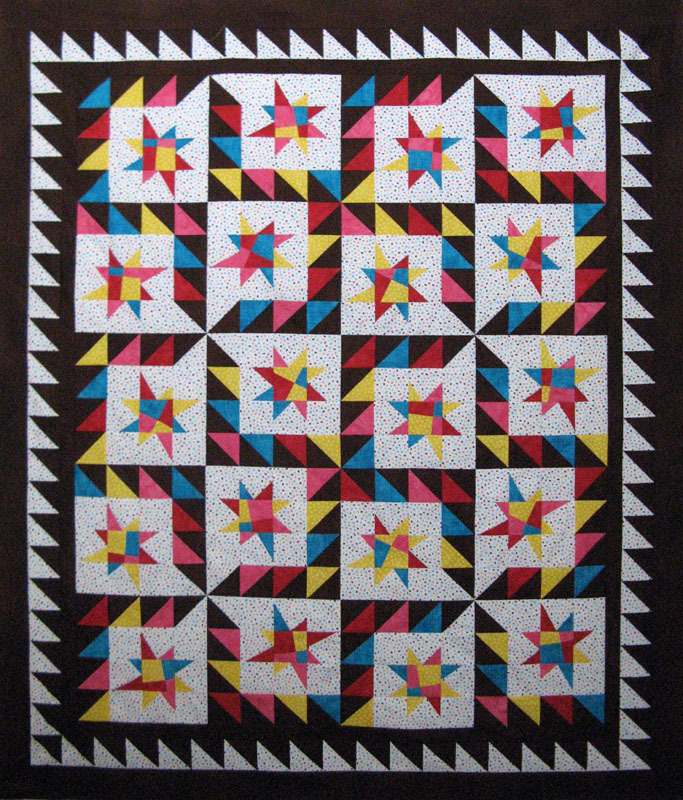 Klappers is a Judy Laquidara pattern called Jazzy Nights that was featured in Quiltmaker September/October 2010 issue. 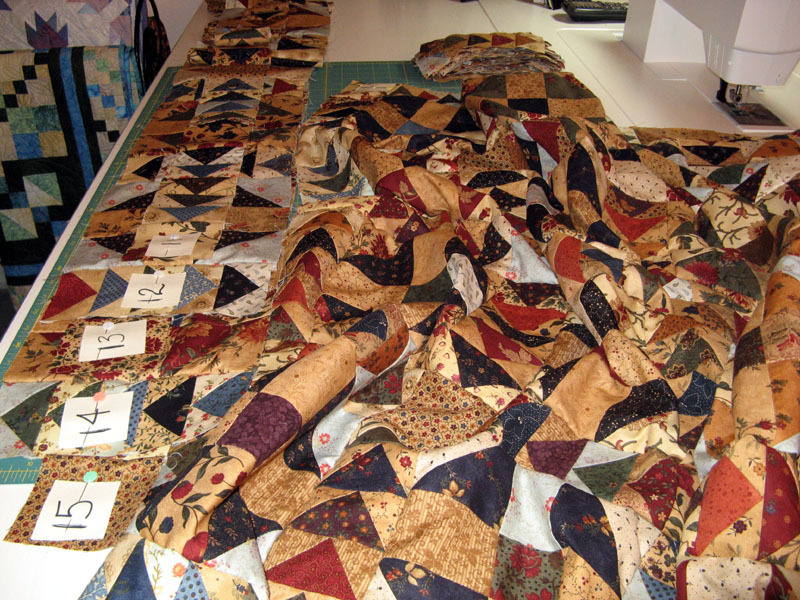 It is a combination of piecing, wonky cuts and foundation piecing. The variety of techniques made it fun to put together. 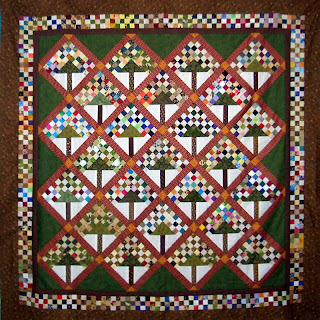 I would have liked to have seen a finished drawing of the entire quilt printed as the orientation of the pieced border tricked me a bit. Notice how the top and right have the HSTs with the light on the inside and the right and bottom have the dark on the inside. I also found the blocks to be easier sewn as a 12 patch rather than the way it was suggested. All said and done Klappers looks great! 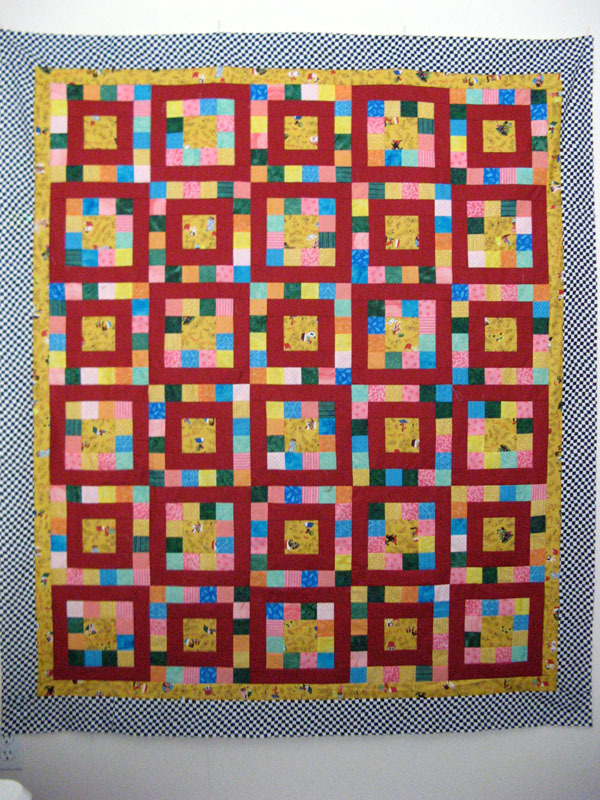 I have Kordova Klosure in a contest with the Quilting Gallery. It's last weeks theme Scrappy. If you have a chance to vote I hope you vote for me. I've linked you back to my Thursday's post where you can get to the voting. So that means I have something to record as used this week. Kerry finished Kommodore this week and I got it yesterday. 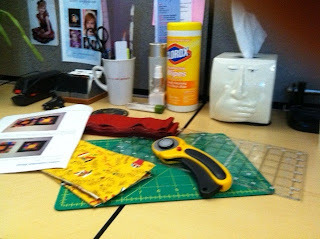 I'll be working today on trimming up, a sleeve, binding, and a label. Next up is finishing Kaktus. Hope you are happy with your stash report this week. 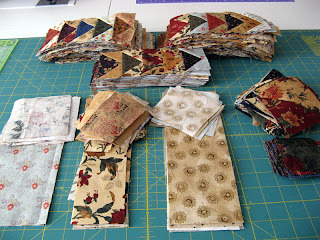 Find out how others used their stash at Patchwork Times. 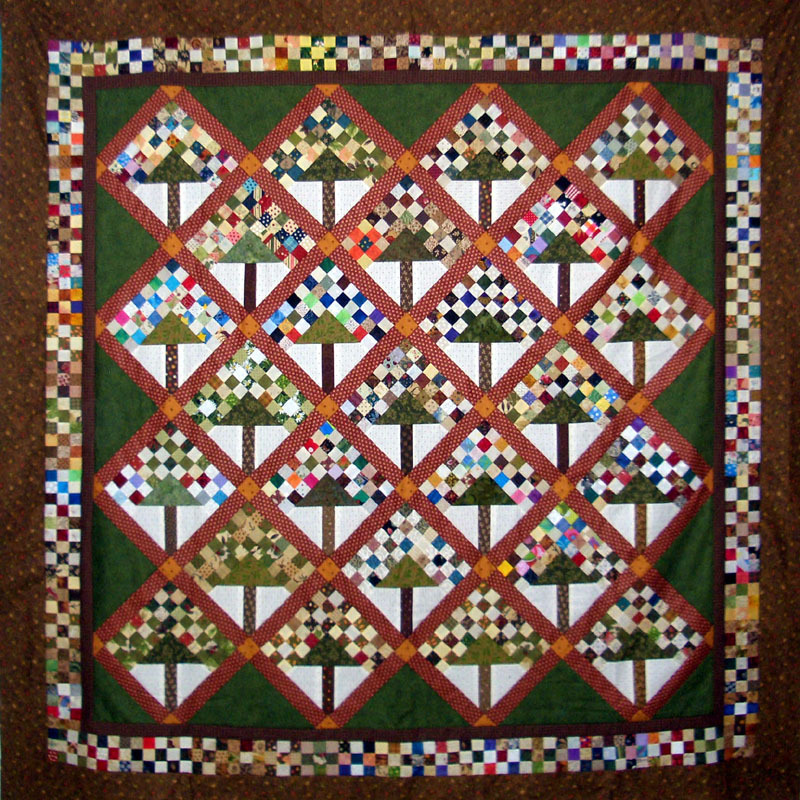 I've submitted a quilt in Quilting Gallery's weekly contest. This week's theme is Scrappy. I make so many scrappy quilts that it was difficult to pick one! Voting will start around Friday, August 17th at 8am EDT and will last until Monday, August 20th at 8am EDT. I'd love it if you cast your vote for Kordova Klosure. 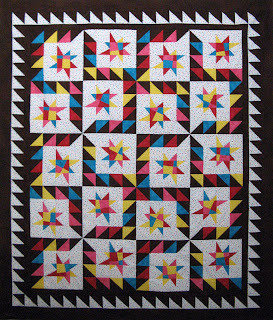 The quilt is Bonnie Hunter's design from last year's mystery called Orca Bay. I made mine into a King size by adding the three outside red borders. You can get to the voting by the link on my side bar called Weekly Themed Quilt Contests. 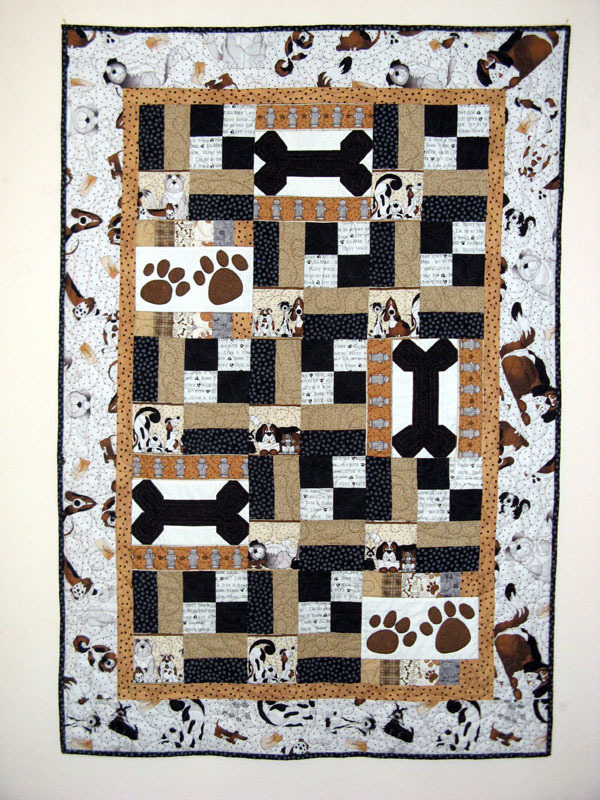 Once there click on the Vote Now: Scrappy Quilts link to submit your vote. I'm coming along on the HSTs for Klappers. All the color blocks have been trimmed into the correct size. I'll be working next on the background HSTs. I figure I'm about half way through this part. By this weekend (which starts Friday for me) I'll be working on the foundation star points. There are 80 of these and I'm only one into that. I've spent a little bit of time starting my August UFO Klappers. 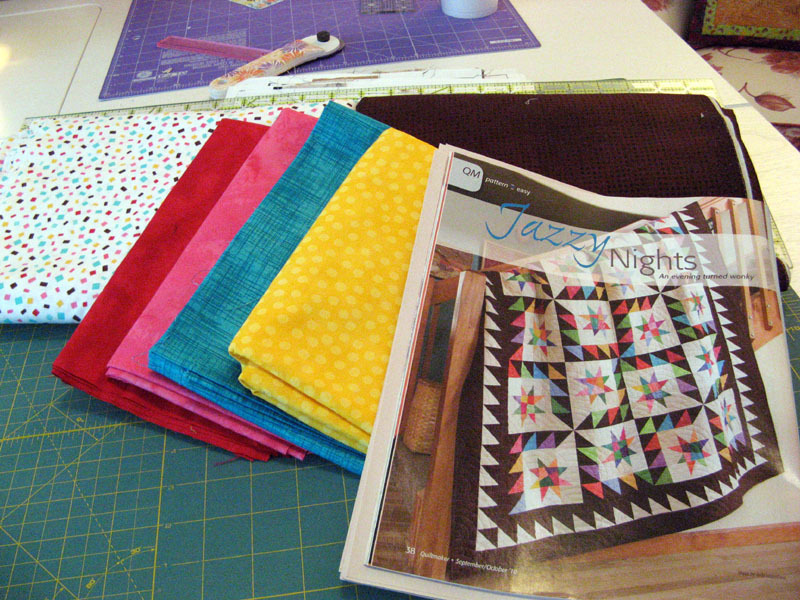 It's Judy's Jazzy Nights pattern from a Quiltmaker issue. 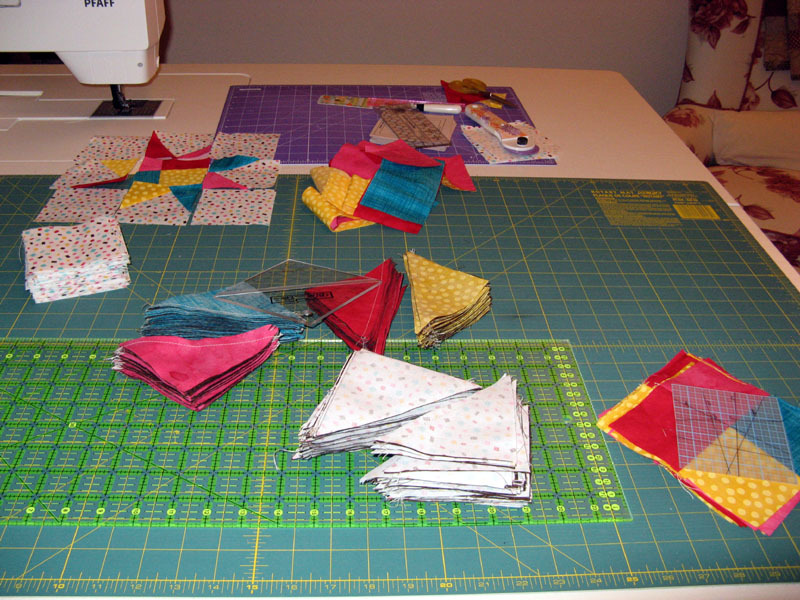 These are the first units...lot's of HSTs. I'll be using my Bloc Loc ruler to square them up. Also are the start to the wonky stars. 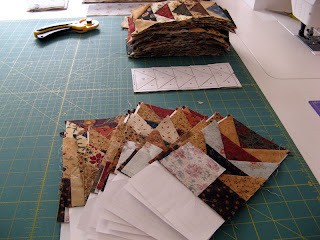 They'll use the four patches and the template along with the foundation piece and the scraps you see next to them. The stars are surrounded by the HSTs in the design. 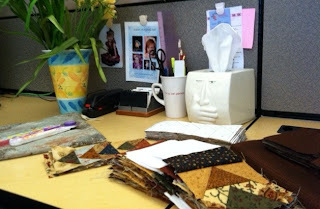 After finishing the Quiltathon project yesterday I kept going on Klappers. 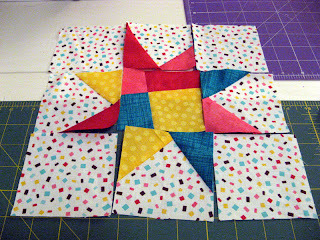 I cut the HSTs in half and started the first of the wonky stars. 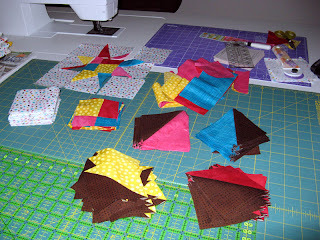 I'll spend lunchtime either squaring up the HSTs or making wonky star centers. I like what I see so far. I'll be back to foundation sewing later tonight. 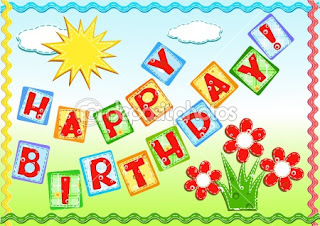 Hope you are able to do what you want to in your sewing room. 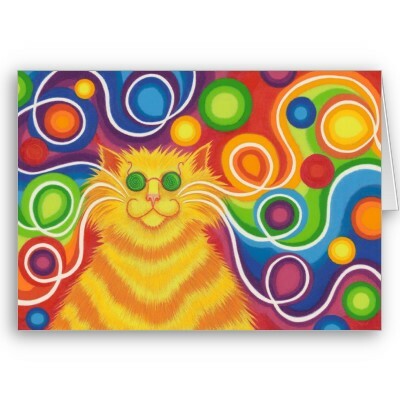 See what others are working on at Patchwork Times. I participated in Judy's Quitathon that started Thursday, 8/9 and went through today. I had my top done about 5pm. I like how it turned out. I made the borders a bit different. The binding will be red. Thanks Judy for bringing another great pattern my way. I have all the flying geese done now on Kaktus. I have a few more HSTs to make and sashing to cut before I can start assembly. It was good to have the flying geese finally done. I didn't spend anytime in a quilt shop this week. I'm still working to get my health up to what it should be. I spent Saturday sewing with Kerry which was great. I worked on my August UFO that I'll show you tomorrow. 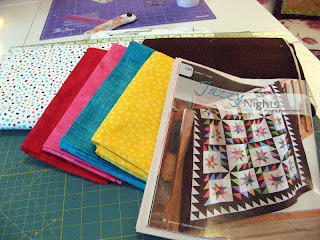 Since I finished the Quiltathon project I'll be showing a use! See how others did this week at Patchwork Times. 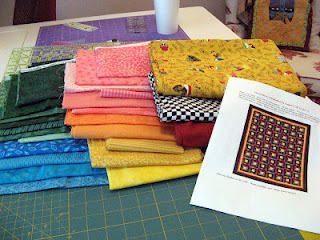 From the first introduction about the Quiltathon from Judy I selected my fabrics. I will be making the smaller size that requires 15 of each block design. Brick red for the dark, a black and white check for the 2nd border, brights that play nice with the inner border for the squares, and a real cute Little Golden Books theme fabric for the inner border and center square of the two block designs. These were cut last night. Today at lunchtime I'll sub cut the 3.5" strips and the 2" strips of brick red into their specific sizes. I've decided it might be faster to sew my 2" strips of brights into strip sets then pick the stitches out where needed to make the set the size needed. Block A will need two each of 2 squares and 4 squares. Block B will need two each of 4 squares and 6 squares. To pull the stitches out will only take the ripper three thread breaks...yes I think this will be quicker for me. I'll be all set to start sewing which will be assembly style when I get home tonight. 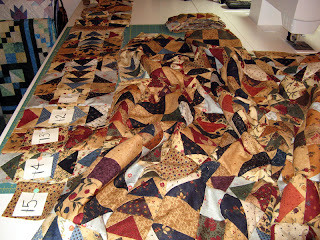 I'll be sewing as many of the 30 blocks together as possible. There is no further direction from Judy today so I guess we are to continue sewing from Thursday's instructions. I can handle that! By the way I made good progress on the last 34 FG for Kaktus. They are on their final FG unit of five that are on the foundation. I'm at the trimming stage, that I'll also work on during my lunchtime today, to be ready for the final wing to be sewn down. Then all that will remain to finish these up will be to remove the paper. I also have all the HSTs marked for Klappers. Thanks Bonnie for getting me through that yesterday. 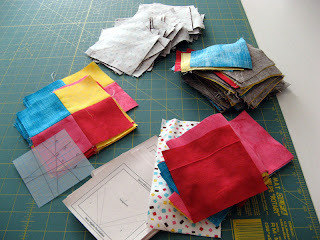 I'll be sewing HSTs tomorrow at Kerry's...our first sew day together in quite some time. I can nearly see the end of the HSTs for Kaktus a future 2012 UFO that I've got a head start on. The 15 foundations just in front of my tissue holder need only the paper removed. I was able to do five of them at lunchtime (the group to the front left). The 34 at the front on the right are at the third FG unit of the five on the foundation. I've been able to do one FG unit to all 34 in an evening. Maybe I should push that a bit tonight and finish. I'll be so happy when they are all done. The brown fabric is for Klappers my August UFO. I've been cutting the fabrics into the required sizes this week during lunchtime as well. Monday I finished the brights, Tuesday I finished the background, and today I finished the dark. 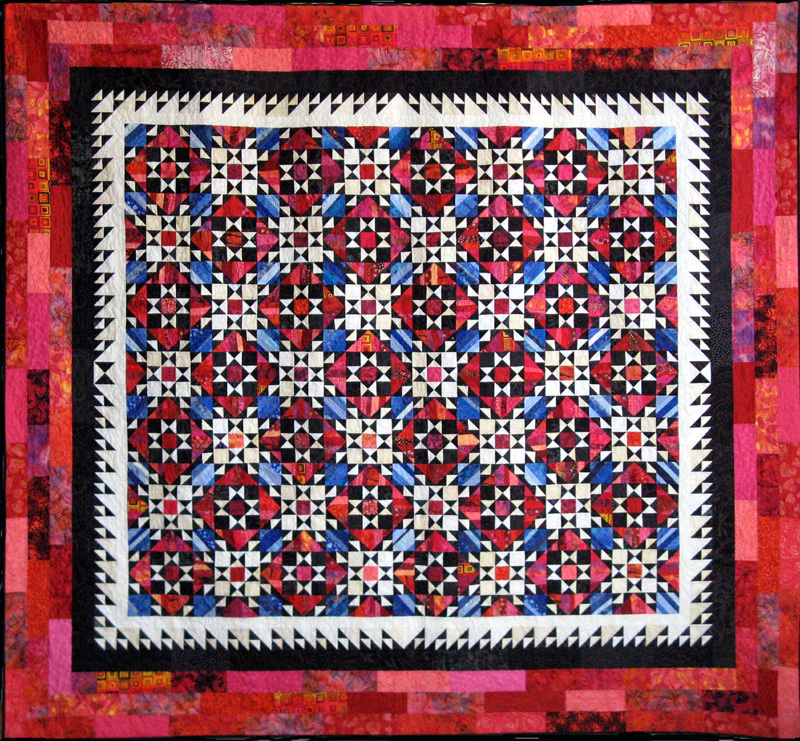 The pattern has wonky stars for the center and the eight points. I'll have fun putting this one together. Today I have a 30 minutes massage on my leg. This will be the third massage to help clear up my sciatic nerve issue. I'm getting better each day, but only right now by the smallest amount. I wish I'd wake up in the morning and be back to normal... Enjoy the rest of your week. Aren't they lovely? I picked up a few items at the grocery store and these just happened to jump into my cart. I don't usually go towards the pinks, but these were the prettiest of the bunches. 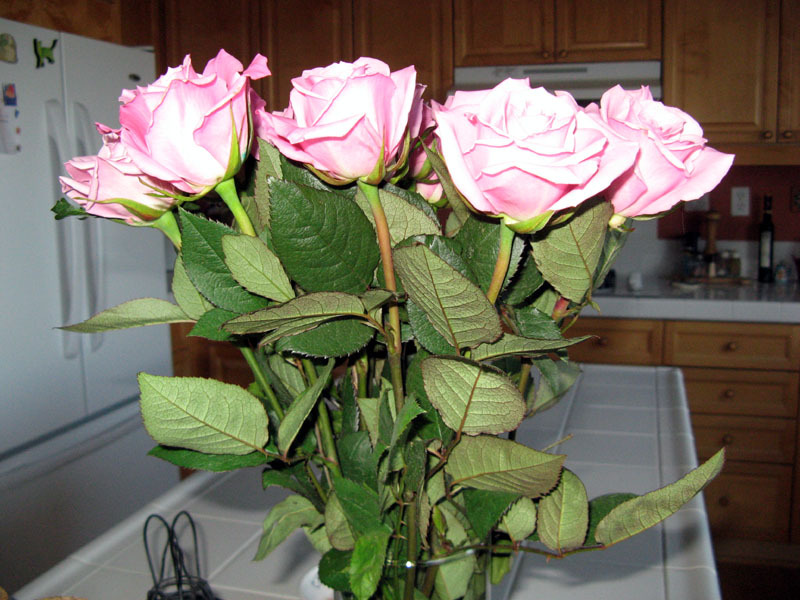 So nice to have flowers to greet you in the morning. 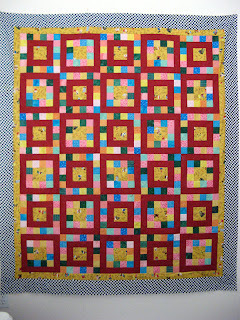 Kerry at Kerry's Quilting and I have been making a donation for the San Diego Humane Society for a few years now that goes in the silent auction at their annual Fur Ball. This year is no different for us. 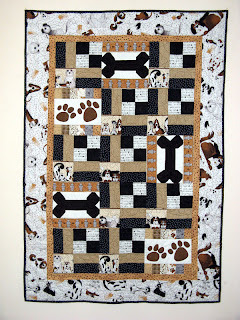 This one is a pattern by Myra Mahy called K9 Kwilts. I'll be mailing this out tomorrow for the event that is to be held on August 25th. I'm still making progress on the gazillion Flying Geese needed for Kaktus. I'll have had my fill of Flying Geese for a while after this project is complete. 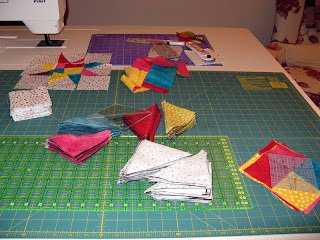 Fortunately my August UFO Klappers which is being started this week is full of HSTs! 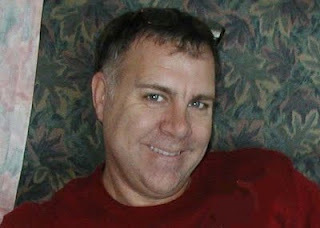 See what's going on else where around the globe at Patchwork Times. I'm working away at Kaktus still. I can't say how much I'm happy to have started this UFO before it's number was called. All the Flying Geese are kicking me good. I have an addition to my stash, but will soon show it as a use. 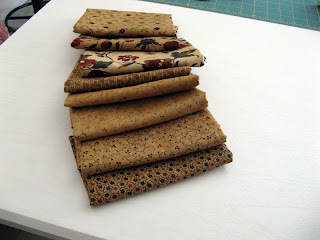 I was certainly tempted to get more because Fat Quarters Quilt Shop had 25% off all Gold fabric. There was this one piece in particular...my will power kicked in. Judy, if you ever need a Kansas Troubles fabric let me know. There's plenty at this quilt shop. I think I've brought into my sewing room all the neutrals I'll need to finish. If not my Mom's found a great selection on eBay too. Will you be doing the Quilt Along with Judy this coming weekend? I'm planning too. Yesterday I went through my stash for fabric possibilities. I'll be using these. The red for the black in Judy's pattern, black/white check for the red, and the cute Little Golden Books novelty for the yellow. I thought the novelty fabric would be cute to fussy cut in the blocks centers. The scale of it is small enough where a good portion would show. The remaining fabrics are all from the colors in the novelty fabric. All from stash and no plans to get anything else. I'll be making the smaller of the two sizes and perhaps change the last border to be the binding still with the red fabric. I also pulled fabrics for my #6 August UFO, Klappers. Seems my mind was thinking along the same colors for the two projects I was rummaging my stash for. That teal blue is one of my favorites. More on Klappers tomorrow. 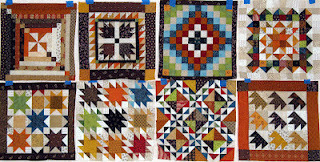 Check back then, but right now check out other quilters using up their stash at Patchwork Times. Wednesday Judy and Jo identified the August challenges that will keep me busy the next 28 days. 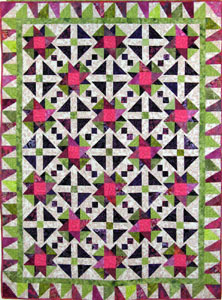 First from Judy's Patchwork Times I'll be working on #7 from the list. 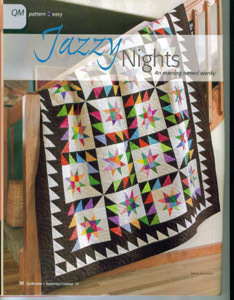 My #7 is Judy's Jazzy Nights design from Quiltmaker's Sep/Oct 2010 issue. I'll need to figure out my dark fabric; hopefully from yardage I have in my stash. Thought at first I'd use Kona Black, but maybe I'll change my mind. Once that's known the scrappy HSTs can get started. There are lots of them...but they'll go quick. I'll more than likely use my Bloc Loc rulers to square them up before block assembly. I'll be calling my quilt Klappers. 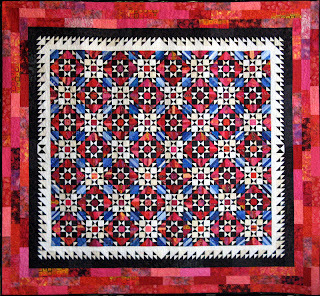 Second from Jo's Country Junction Quilt Square Quilt A Long it's "Your Choice" from the Quilt Squares #4 pattern by Lori Smith. I decided the Double T needed to be made. I was on a role making July's block and kept rolling. So I'm ahead of schedule YIPPEE! This will be the last design from this pattern. 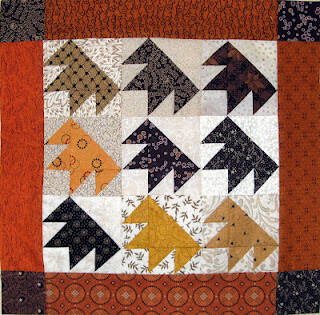 We used Quilt Squares #1 pattern for the first four months of 2012 and we will use Quilt Squares #6 pattern for the last four months. These are my blocks so far. I continue working on Kaktus #6 on my list of 2012 UFOs. Looks like I'll definitely need more neutrals. 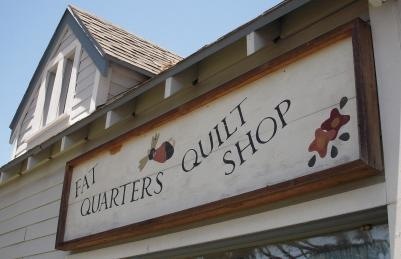 I think a visit next to Fat Quarters Quilt Shop in Vista, CA is in order. #6 has yet to be called; sure happy I've had time to get a start on this one. Not sure I could have finished it in a month. You can look back on previous posts for where I am on this project or come back Monday when you'll see what's on my design wall. Thanks for all your well wishes on my health. It is real slow but I'm getting a little better with each passing day. I worked this entire week making a a bit of the lost time from the week before. Wednesday I started massage with another appointment tonight. Physical Therapy is scheduled to start on August 20th. I'm told this will take some time and it's proving to be true. At least now I can sit at my sewing machine...that is of course if I'm not too tired from the crazy hours I've been working. I can't wait until tomorrow when I can sleep in and stay in my PJs until I feel the desire to change. DH has been great helping out with meals and clean up. Koko would have STARVED in the morning two weeks ago until I could get his can of Fancy Feast in front of him. I sure miss those DH prepared breakfasts this week :(.